> Could forests provide an answer to the energy supply problem? Environmentally induced migration is on the increase, above all in developing countries. The expansion of droughts and soil degradation, increasing water shortage, storms, and floods, combined with poverty and unstable institutions, are the driving forces thrusting more and more people to migrate. Professor Myers of Oxford University estimates that in the year 2050 the number of persons displaced due to climate change will rise up to 200 million – making every 45th human being an “environmental refugee”. The term “environmental refugee” is highly controversial. First of all, environmental change is rarely the sole trigger of migration. Economic, social and political conditions are equally important factors. Second, the term is criticised for being confusing from a legal point of view. People who leave their homes due to deteriorating environmental conditions do not fall under the refugee definition set forth in the Geneva Convention Relating to the Status of Refugees. The protection provided to refugees through international law does not apply to them. Today, the most widely used term is “environmental migrants”. Up to now, environmentally induced migration has remained a largely neglected aspect of climate policy. In many cases it has been misperceived as a failure of adaptation efforts and has incurred negative assessments. However, migration has always been a coping strategy to reduce people’s vulnerability. Do people actually decide to migrate? What are their destinations – the nearest city, a neighbouring country, or Europe? How long will they stay away from their places of origin? These are complex questions. Often, the poorest population segments lack the means to migrate. Moreover, migration behaviour will differ depending on the main migration cause: are people leaving due to continuous environmental degradation (e.g. water shortage or soil degradation), or is it extreme events such as sudden drought, storms and floods that are causing people to relocate? At present, knowledge on how such decisions are made is insufficient to effectively tackle these challenges. Avoiding environmental migration has utmost priority. Climate change must be mitigated and the population’s vulnerability reduced by means of economic and social development. Migration as a coping strategy must be accompanied by targeted measures. Emergency aid in the wake of extreme events must be efficient and well-prepared. Long-term government-planned resettlement programmes to evacuate areas that are highly prone to floods and droughts can help to structure migration and ensure better integration of migrants in the destination areas. Environmental aspects must be strictly integrated in migration policies, and, vice versa, migration aspects must be considered in environmental policies. Cooperation must be improved between states and regions (of origin and destination), as well as between the various disciplines (environment, migration, prevention, health, spatial planning, conflict prevention). Developing countries will be particularly heavily affected by migration between and within countries. This represents a great challenge for international donor countries. Implementation of the above-mentioned measures depends on their support and, at the same time, it is the only way to avoid future conflicts. 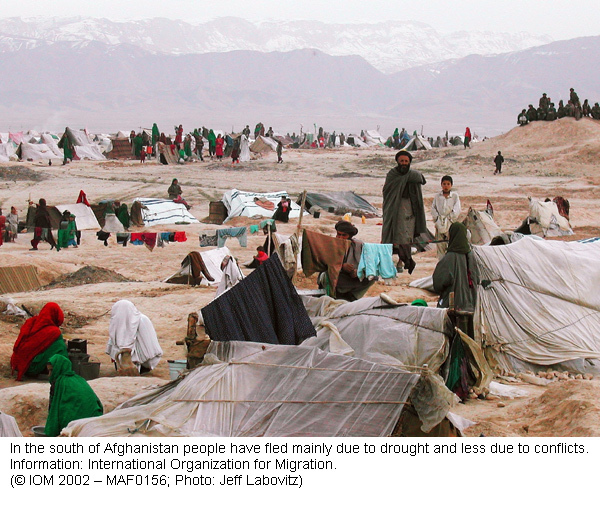 > Assessing the impact of climate change on migration and conflict. C. Raleigh et al. The Social Development Department. The World Bank Group. 2008. 49 p.
> Climate change, environmental degradation and migration: preparing for the future. Seminar in the context of the meeting of the Commission on Sustainable Development (8–14 May, 2008) New York. www.unitarny.org/en/ccmigration.html (of special interest: Preparing for the future: IOM’s global strategy on environmentally-induced migration, Mr. Philippe Boncour, IOM, May 2008 Powerpoint presentation). > World in Transition – Climate Change as a Security Risk. German Advisory Council on Global Change (WBGU). 2008. 248 p.
The world market prices of some staple foods have more than doubled since 2003. Accordingly, products such as rice or maize have become massively more expensive also on local markets in developing countries. The reasons for this development are manifold, the consequences dramatic. While certain farmers producing cash crops profit from the increased prices, the masses of the poor, who buy most of their food on the market, are facing enormous problems. For a family already spending 60–80% of their household income on food, a rise in food prices may mean that they can no longer pay the rent, school fees or medication. The International Food Policy Research Institute (IFPRI) therefore points out that there is an urgent need for political measures. Humanitarian aid and a moratorium on biofuels can mitigate the situation in the short term. In the medium term, social security must be improved by means of microfinance and cash transfer programmes. Most importantly, however, investments in sustainable agricultural growth need to be increased. In the medium term, according to IFPRI, improved rural infrastructure, services and technologies could enable the poor population to profit from high prices as producers. > High Food Prices: The What, Who, and How of Proposed Policy Actions. Joachim von Braun et al. IPFRI Policy Brief. May 2008. 12 p.
With their fairly unrealistic goals of drastically reducing dependency on fossil fuels and CO2 emission, the USA and the EU have triggered an agrofuel boom. On the American continent, this has already led to a massive reshaping of the rural environment. Along with the USA, Brazil, Argentina, Colombia, Ecuador and Paraguay are engaging in large-scale agrofuel production. Sugarcane, oil palm, soy and maize are grown in extended monocultures. The authors report that the ecological consequences are often alarming: soils are being degraded, rivers polluted, forests cleared, and biodiversity vanishing. In addition, there is a concentration of land ownership and income. Many people are losing their land or their jobs. Diversity of agricultural production is diminishing, and an increasing quantity of food needs to be imported. A case study from the southern Pacific coast of Colombia shows how large-scale palm oil producers oust the native population. They illegally take possession of community land, drive farmers off their farms, and have even killed persons who tried to resist. The State is powerless or turns a blind eye. In a collection of pronouncedly critical contributions, the journal “Semillas” describes the impacts of the agrofuel boom in Colombia, as well as resistance efforts by the affected population. Source: Los Agrocombustibles. Una receta para un desastre ambiental y el hambre en el Sur. Revista Semillas numero 34/35. Diciembre 2007. Today a new type of water scarcity is emerging, caused by a combination of factors like climate change, greater variation in rainfall levels and the use of water to produce non-food products (e.g. bioenergy). By the time food reaches our plates, much will have already been lost during the production process. A certain percentage of these losses also occurs further along the food chain, i.e. during the storage, transport, processing and preparation of food. In fact, this food wastage also represents a water wastage, as it has consumed a certain quantity of the water which has been needed for crop maturation. If we are to reduce wastage in the food chain, we have to think less in terms of quantities and more about the type of foods we produce and how they benefit us. This will be difficult to achieve due to the growing distances between the urban consumer and food production sites. In addition, certain actors and segments of the food chain should receive compensation or financial support to invest in technologies or methods which could help curb wastage and spoilage. For example, by improving how they store their harvests, farmers could not only boost their income but also improve their food security. Given that sensitising society about food and water wastage is a long-term undertaking, consumers could already be made aware of the issues from an early age, i.e. at school. Source: Saving Water: From Field to Fork: Curbing Losses and Wastage in the Food Chain. Göran Berndes et al. SIWI, 2008. 29 p.
Why do countries that are particularly rich in natural resources develop more slowly in average? Researchers frequently link this phenomenon – known as the “resource curse” – with corruption. On the one hand, the availability of natural resources increases opportunities for making easy profit via rental contracts, i.e. without having to provide any work input. This phenomenon is called rent-seeking and incurs social costs, since a great amount of know-how, time and energy are invested in non-productive activities. This can bring slow economic growth. At the same time, wealth in natural resources is an incentive for governments to reward their supporters with rents from natural resources in order to reinforce their own position of power. On the other hand, corruption infiltrates natural resource management systems, e.g. when the various parties get involved in negotiating concessions defining property rights, exploitation periods and distribution of revenues. This is particularly visible in the oil and mineral industries, but it also happens in relation to renewable resources such as agricultural, forest and marine products. Institutions allocating natural resources as well as those which support democratic accountability can counteract the resource curse and the related corruption. Donor countries should therefore support such institutions, with a priority focus on combating rent-seeking behaviour. This article is intended as an introduction to the topic and does not offer any specific recommendations. Recommendations, along with further reading, will be made continually available on the Anti-Corruption Resource Centre’s website. Source: Corruption in natural resource management – an introduction. U4Brief. Chr. Michelsen Institute. 2008. 4 p.
Could forests provide an answer to the energy supply problem? Sources of wood for energy may be derived from wood residues, from plantations established solely for the purpose of wood production, or from secondary forests and less-used plant species. Yet, the availability of these resources, and their potential to replace oil as a biofuel in the future are unevenly distributed throughout the world. Many developing countries rely on wood as a source of energy for heating and cooking, but these resources are often threatened by the loss of forest cover due to growing population. While a large share of the electricity consumed in Brazil, the Gabon and Malaysia, for example, could be produced from wood residues, the same would not apply to countries like Thailand, Colombia and Peru. In the years to come, technological innovations could help boost the carbon and energy efficiency of wood production systems. For example, the conversion efficiency of wood pellet stoves to produce biofuels from cellulosic materials could be as high as 80%. The publication helps enlighten the political debate by addressing not only wood-based biofuels but also other key issues, such as the resolution of land use conflicts. Source: Forests and Energy : Key issues. FAO, 2008. 56 p.
One half of the world’s working population are farmers, and the majority of them are small-scale producers. 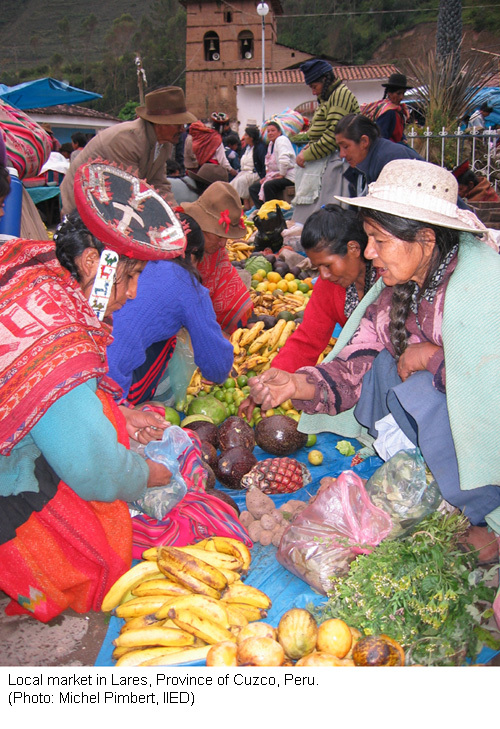 An enormous number of people thus earn their livelihood within local food systems. 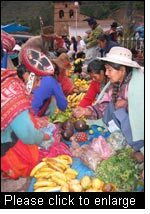 They produce for their own subsistence and for the local markets, usually in a traditional manner. However, these small-scale producers are more and more under pressure. On the one hand, food production is increasingly controlled by few large corporations. On the other hand, development cooperation often comes with the view that small farmers should shift to other sectors. The principles underlying this development are those of a neoliberal economic policy. In view of these facts, a growing farmers’ movement in the North and the South is calling for a radical reform of the system towards an increased focus on food sovereignty. Food is to be seen mainly as a good to feed people and not as merchandise. The right to food is to be attributed more importance, and local and national subsistence must be ensured. Sustainable use of natural resources and political participation by rural populations are further important concerns. The farmers’ movement is increasingly gaining importance around the world. This document conveys the farmers’ perspective in an innovative way by means of quotations as well as audio and video material. Gender mainstreaming must be part and parcel of future climate policy development, especially in relation to policies which aim to cut carbon emissions or to alleviate poverty. This concept has already been applied to a few issues such as energy supplies, access to water and disaster response. However, work on and information pertaining to almost all other climate change issues, for example climate-related migration, have largely overlooked the gender dimension. Last April, the Women for Climate Justice Network launched a website in a bid to resolve this situation. As an information platform, the website describes existing knowledge and expertise on gender mainstreaming in climate policy discussions, as well as efforts made in this regard. Although still in its infancy, the diversity and quality of the links and references featured on the website is highly commendable. It primarily draws on the knowledge and expertise of a global network of individuals and institutions working in the field of gender and climate change today. Hopefully, contributions and articles in other languages besides English will also provide for linguistic diversity. Source: GenderCC – Women for climate justice. Platform for information, knowledge and networking on gender and climate change. The growing frequency of disasters calls for making the protection of people at particular risk and the rehabilitation of their livelihoods an urgent priority. Adapted measures are important to counteract this problem. A new toolkit is intended to provide support in this regard. The toolkit distinguishes three steps. First, it is important to take stock of the “normal” forms of existence and livelihood activities in the affected region, including information on the population, on material and immaterial assets, the market situation, the national economy, etc. The second step is the assessment of the situation shortly after the disaster, in terms of the gravity of impacts, first coping strategies, and possible sources of funding for reconstruction. Finally, at a later stage, the long-term disaster impacts, the possibilities and capabilities of recovery at both the household and the community level, and the potentials of the local economy must be evaluated. The toolkit has a modular structure and can be used either as a whole or in the form of individual modules. Its great advantage is that it provides guidance for elaborating a good synthesis that allows for rapid capturing of priorities as a basis for project formulation. However, the toolkit is clearly geared to UN structures, and implementation requires previous knowledge in project management. Over the past few years, the Common Market for Eastern and Southern Africa (COMESA) region has witnessed the declining productiveness of its agricultural sector and growing food insecurity. To boost competitiveness, COMESA member states have signed up to a number of programmes aimed at coordinating not only regional agricultural policies, but also product marketing, trade, and the exploitation of forestry resources. However, these countries are also aware that greater economic activity brings with it the risk of environmental degradation and that their long-term economic growth depends on the sustainable utilisation of these natural resources. This report casts a critical eye over the role of forestry products and services, and the challenges associated with their trade. Faced with the soaring demand for forestry products from emerging markets like China and India, COMESA should evaluate and closely monitor the terms of its trade agreements, if it is to assess the impact of this economic trend on its forests. Source: Sustainable Trade and Management of Forest Products and Services in the COMESA Region. Anthony B. Cunningham et al. CIFOR, 2008. 92 p.
In developing countries there is an increasing demand for meat and milk products. The FAO therefore estimates that the global production of these goods will double by 2050. Such a development can have very negative consequences for the environment. Loss of biodiversity, pollution and overuse of water bodies and greenhouse gas emission are only a few keywords in this regard. Therefore, measures to promote sustainable development are necessary in both intensive and extensive systems. Nevertheless, the boom in livestock production hardly improves the situation of poor population segments. As consumers, they suffer from rising food prices. As producers, they would theoretically be able to benefit from the increasing demand. They traditionally use animals for their own nutrition, as a source of income, or as draught animals. However, international sanitary standards focusing on the geographic origin of animal products block their access to the international market. An increased focus of standards on product quality, on the one hand, and improved veterinary basic services, on the other hand, could contribute to extend the benefits of the rising demand beyond few producers in a number of countries in transition. > The growing demand for livestock. id21 insights 72. February 2008. 6 p.